Confused by some of the industry jargon? If you have been shopping around for a new shed, you have likely come across a few terms you don't know. To help you understand the in's and out's of a shed, we have put together a comprehensive shed glossary that lists a bunch of shed building terminology and definitions. If you still have questions, feel free to give us a call on 1800 350 450 to speak to a shed expert. Australian Steel Institute (ASI) Shed Group promotes the construction of cold-formed shed structures and promotes steel shed industry compliance. TechSpan Sheds are build from structural steel. a much stronger alternative the cold formed sheds. The peak of the roof line. Barge Capping are typically right angled flashings installed at each end of your shed. The capping seals the gap between the top of the wall sheeting and the side edge of the roof cladding. The plate on the base of a Column the attaches the shed to the concrete footings. Base Metal Thickness. - The thickness of the metal. This does not include coatings and paint. Bill Of Materials. This is a list of raw material, parts, items, assemblies and other components that make up your shed. This is a type of steel purlin that is shaped like the letter C.
Capping is an alternate mane for a flashing. It is used to cover and seal gaps between your roof cladding. Two types of capping include Barge Capping and Ridge Capping. This is the external metal sheeting, it comes in two different profiles, Corrugated (Custom Orb) and Trimdeck. This can be supplied in a Colourbond or Zinc Finish. This classification refers to buildings that will be used as livable dwellings Some sheds have this classification such as hangar homes. This classification refers to non-habitable buildings. It is common for buildings such as industrial sheds, hangars, horse arenas and farm sheds. These are steel plates used to connected sections of the shed together with bolts or tek screws. This is a brand of pre-coated coloured cladding by BlueScope Steel. Angled steel cappings installed vertically in a corner situation to cover any gaps between cladding to make the building watertight. This is the diagonal bracing member which keeps the shed straight and square when it is under load. This is the name given to a corrugated roof sheeting and wall cladding by BlueScope Steel. These are the Building that are engineered to a higher structure strength as they are located within a Cyclonic (Region C) area. Refers to the bracing effect that roof and wall cladding have on a building. A doorjamb, door jamb (also known as a doorpost) is the vertical portion of the door frame that a door is secured on. These are the pipes that carry storm-water from the gutter to the ground or a tank. They are commonly made from PVC. This is the over hang of the shed roof. The End wall the wall located at the Gable end of a shed. When purchasing a steel building you will be issued with a engineers certificate. Each design certification is generated specifically for your structure, base on site conditions and shed usage. An engineering certificate will be needed when submitting a building application to your local council. This is a step during your buildings construction where an independent engineer will evaluate your design and the future site of the shed. During this stage the engineer ill give further feedback and recommendations for your shed. We explain this in detail in our Shed Construction Process guide. This is the bracing which supports the truss square to the purlins. The Footing of a shed are also known as Piers. These are typically bored holes in the ground. Steel Hold down Bolts are cast in to these piers for the Columns to be fixed to. This is the main 'skeleton' of your shed that the cladding, doors, windows, and other components are attached to. A Gable is the most common roof line for sheds. It is a triangular designed with two sloping roof sides that meet in the middle. A gable wall is an end wall that is peaked. This is a small shed normally enclose which is use to store cars and other household goods. A Girder truss (or Header beam) refers to the beam running across the opening of an open bay, roller door. This provides additional horizontal support above the door and is often used to attached sheeting. These are the roll formed structural members that run the length of the shed walls to support the wall cladding. This is a cleat that attaches wall girls to columns and roller door jambs. A general purpose bracket for attaching headers, girls, mullions and other shed components. A Gutter is a small steel channel which runs the entire length of the eve of the roof, it is used to collect and carry away rain water. A gutter bracket is a small bracket use to support the gutter of the shed. This is the connection between the Column and the truss. Hold Down Cages/ Brackets are the pre-fabricated Bolt combination which is pre-cast into the piers on which the columns are fixed. Normally around 1 meter in length depending on the size of the shed. The important level is determined how you plan to use your shed, its location, and the overall risk it poses to human life and other structure if it were to be damaged. Insulation refers to the different materials that are used to insulate building. This is the distance from the front of the building to the back along the eve side. For example, if you had a shed with 3 four metre bays, you would have a shed with a length of 12 metres. This is a raised floor inside the shed structure. This is a vertical column in the end walls use to support the end wall cladding. It is also the name of the columns use to support the sides of roller doors. Multi-Span is when you have a one or more columns to support the roof rafters mid span to allow you to get a larger area under your roof. An open front/ open bay shed has a side, or part of a side open, with no wall cladding to hinder access. Personal Access Door is a small door just for personnel access. These are normally required in industrial building for use as Fire exits. These are the roll formed length of material the run perpendicular to the trusses to support the roof cladding. This is the folded flashings that seals the gap between the roof cladding that meet at the top of the building to protect your building from weather and stop water leakage. The pitch of the roof refers to its angle in comparison to the ground. We commonly use 5 or 7.5 deg. A roof ventilator is installed close to the apex of your roof to draw air from the building and assist with ventilation. They ensure there is proper air circulation in your building, reducing air moisture and mould in winter and heat build up in summer. More information on roof ventilation types can be found here. This is the safety mesh which is fixed to the roof prior to insulation and cladding. It is used to protect the installers during installation and maintenance. This is a shed the has no Gable, one high side and one low side. A translucent sheeting that can replace roof cladding to allow light into your building. The width of the shed and/or the distance between the columns. Total Coating Thickness. This is a term used to describe the overall thickness of a coated or coloured sheet steel. This is essentially the total thickness of the Base Metal Thickness plus any paint or coating. Tek Screws are the screw use to fix the cladding to the shed. This refers to the characteristics and surroundings of your shed's location. Refers to sheds that are erected in very open and exposed terrain. This refers to buildings located on or near coastal short areas and enclosed bays that extend more than 10km. This refers to buildings that are usually located in areas with open terrain and few obstructions between 1.5 metres and 5 metres. This is often the case with cleared farm land. This refers to buildings located in semi-rural and urban areas with obstructions of similar height. This mostly refers to buildings located in built-up suburban areas. This terrain type has a number of obstructions of similar height, including other buildings and dense tall tree bushland. This refers to the topography of your shed's location. This includes the altitude, slope and direction of your shed's location. The Top Hat is a lightweight purlin sometimes used on light duty sheds our small spans. This is a common profile of Cladding. with 5 distinct ribs and wide flat pans between the ribs. This is installed between a concrete floor and wall cladding to prevent vermin, lizards, snakes etc. from entering the building. It can also prevent corrosion of your wall cladding which can be caused by direct contact with the concrete slab. The wind speed directly relate to what region you are located in. Region refers to your geographical location within Australia. 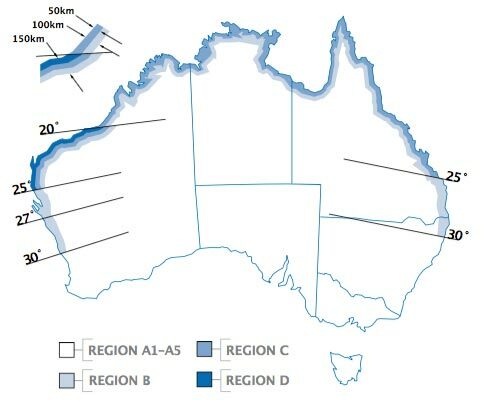 Australia has been divided into regions depending on the likely wind speeds in that area. They are Region A, Region B, Region C and Region D.
Wind Region A is Ultimate Design Wind speed of 41m/s or 147.6km/h. This wind speed region covers most of Australia. Wind Region B is Ultimate Design Wind speed of 51.9m/s or 186.84km/h. This sub cyclonic wind speed region covers 100km's inland from the coast of QLD, NT, and most of WA. Wind Region C is Ultimate Design Wind speed of 64.5m/s or 232.2km/h. This cyclonic wind speed region covers the 50km's inland from the coast of Northern QLD, NT, and northern WA. Wind Region D is Ultimate Design Wind speed of 88m/s or 316.8km/h. This severe cyclonic wind speed region covers the 50km's inland from the central coast of WA.